Randall Norris was succeeded in 1818 by the Reverend William Henry Rowlatt, MA, a member of the Inn (called to the bar in 1804) who had subsequently taken holy orders and was at that time Reader of the Temple Church. Rowlatt is credited with initiating many overdue improvements during his tenure of office. In 1818 the need for new measures was raised at Bench level. Scots Law, for example, was inadequately represented and it was ordered that books on this subject should be bought at a cost of £200. In 1825 attention was drawn to the fact that the Library was poorly heated. The walls contained apertures which admitted the cold air in winter, and it was suggested that these should be closed by sliding panels, which action would then allow the temperature to rise in the room. It was further suggested that the room to the north of the Library should be fitted with a stove and with shelves for books (by now the great majority of books were kept in open presses); it could then be partitioned so that the Librarian might use it to superintend the room to more advantage “than he could when in the winter season the severity of the cold weather renders it almost impossible for him to be constantly in the Library”. In addition a committee that year issued a new and detailed statement on the duties of the Librarian and directed him to make an “accurate catalogue of the books and manuscripts arranged alphabetically, according to their respective subjects and continue the same as additional books or manuscripts are received into the Library and should also make a shelf catalogue of every book in each shelf. These should be printed copies of such catalogues, two of which should be interleaved … and there should be six copies kept on the table in the Library, for the use of those frequenting it”. Five hundred copies were to be printed and it was issued in 1833, a classified catalogue like its predecessor. A new alphabetical catalogue was ordered in 1842 and published in 1843. It shows the Library’s holdings as being approximately 5,500 titles representing over 12,000 volumes. There were, in addition, 492 volumes of manuscripts. In 1851 the rebinding of the Petyt MSS was initiated, a task that was to extend over twenty years, while in 1856 J E Martin, Librarian to the Duke of Northumberland and already Sub Librarian to the Inn, was appointed to succeed Rowlatt. 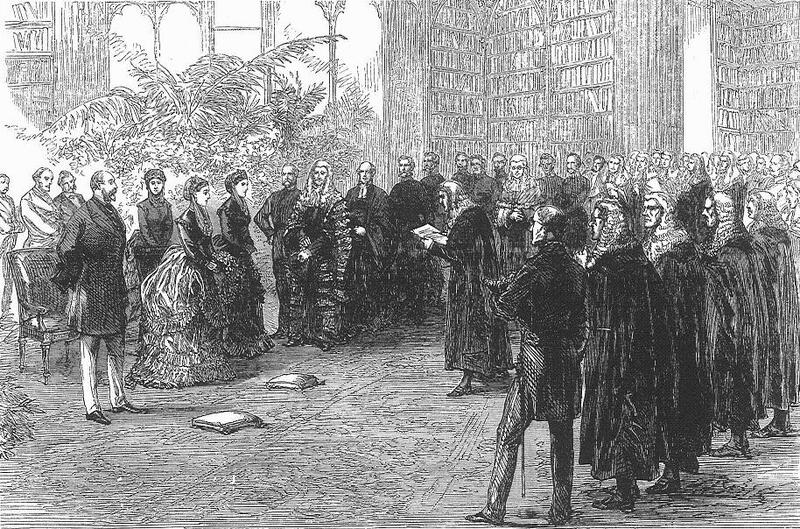 In 1860 he wrote to the Bench on the need for expanding the Library and this resulted in the accommodation being extended in 1867, 1872 and 1882, by which time it consisted of eight large rooms with a gallery all round. This was sufficient to hold 85% of the entire stock on open access. Heating in winter was by coal fires in large fireplaces and the reading desks had, subsequently, table lights. Admission was strictly confined to members of the Society. Others, including barristers of the remaining Inns, could be admitted only upon special application. The main entrance was via a staircase in the clock tower on the south east corner of the building and the Librarian sat in the open at a desk in the first room. Martin was succeeded in 1883 by J.E.L. Pickering who had been Sub Librarian since 1869 and it was under his direction that in 1892 a new catalogue was prepared “written by type-writer”. This was fourteen years after the first shift-key typewriter was commercially marketed. It was to extend to twenty one volumes, kept up-to-date by revision and retyping, and it was in use for fifty years. It is a tribute to the skill of both Martin and Pickering as library organisers that the printed library plan for the guidance of readers and showing the location of the collection was still effective without alteration in 1939, forty seven years later.